Recent studies by the CDC (Center for Disease Control and Prevention) indicated that the ratio of new marriages to divorce is 2 to 1. That means, for every 2 new marriages that occur, there is 1 divorce case happening. This is one of the highest number recorded in the US. In fact, US rank #5 in the world for divorce rate according to the United Nations Statistics Division which surveyed 200 countries. What is the reason behind the divorce rate being so high despite living in a country that is known to have no shortage of information or education resources? "It is the complete lack of understanding of what is a marriage in the first place." 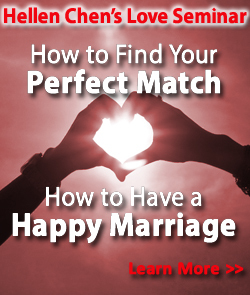 explained marital expert and matchmaker Hellen Chen from Los Angeles, California. "There are classes for sciences and technologies and the study of human behavior but there are actually no lessons taught to a young person about how to fulfill the role of a husband or wife. Simply put, there is no marriage education." said Chen, who has written 19 books on marriage and relationships and who has traveled around the globe giving seminars on marriage management. "People generally know more about their iPhones than how to be a spouse." Chen smiled. It seems that 50 or 60 years ago, there were more informal education shared by concerned grandparents and parents and even relatives about the role of a man and a woman in a family. Schools and churches passed on education about the responsibility of maintaining good relations at home. Yet, as science and technology progresses, the emphasis on academic achievements leaned more and more heavily on whether you are getting the right answers to a test and what kind of jobs you would have when you graduate. Unfortunately the much needed subtle art of managing a relationship and how to be a wife or husband is seldom taught except in certain homes. "There is nothing wrong to be a A's student and get top grades. But you have to invest the same energy to learn about one of the most important part of our adult life: marriage. I have not met any person who had not at one point dreamed about having that perfect love. So if one has desired it at one point, why not learn how to make it come true?" said Chen. To increase marriage education and awareness for the public, Chen started a national “I Am There For You" Movement. This movement is about promoting families and marital education. Chen said, "We have been taught to walk away from problems. If you don't like a job, quit. If you don't like your parent, just stop talking to them. If you don't like your spouse, divorce. Thus this campaign encourages people to take a different attitude. Instead of saying, 'Who cares?' Why not say, What can I do to be there for you?' or 'How can I improve myself, so I could be a better wife or husband or parent or child?" 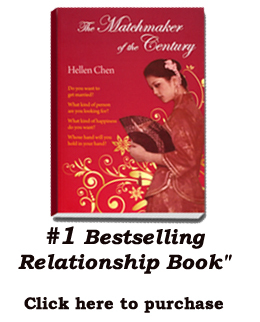 Having brought together many married couples who had been resistive about marriage in the first place and then helping them to stay in marriage afterwards, Chen also shares real-life stories in her latest book "The Matchmaker of the Century". In support of the "I-am-there-for-you" movement, Barnes and Noble is launching Chen's new book 'The Matchmaker of the Century' on Oct 3rd Wednesday and offering the book at a 35% discount - a one-day only special.